Watch the famous Mazatlan sunset from the water with a drink in your hand, from the deck of the Renegado double-decker catamaran. Fun is the name of the game aboard the Renegado. 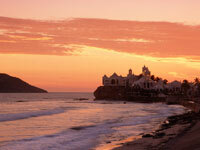 You'll start off enjoying vistas of the Mazatlan skyline, as the sun begins to set over the Pacific. As you enjoy the free-flowing booze, the colors start to splash over the sky. After the cruise, you'll be dropped back off just in time to start sampling the wild Nightlife in Mazatlan. Board the double-decker catamaran for a good time and a cruise around the bay.